Heat oven to 400°F. Place 1 pastry round or pie crust in 9-inch glass pie plate; flutes edges. On lightly floured surface, roll second pastry or pie crust to 13-inch round. With 1 1/2-inch star cookie cutter, cut out 45 stars; set aside. Place almonds in food processor. Cover; process until finely chopped. Add butter, 1/4 cup granulated sugar and the flour; process until blended. Add 1 egg and the almond extract; process until blended. Spread mixture evenly in pastry-lined plate. In large bowl, mix 1 cup granulated sugar, the cornstarch and orange peel. Add raspberries; toss gently. Spoon berry mixture evenly over almond layer. In small bowl, beat 1 egg and the whipping cream. Arrange stars in circular pattern on top of filling (with tips touching), covering entire surface. Brush rim and stars with egg mixture; sprinkle with coarse sugar. Place cookie sheet on rack below pie in case of spillover. Bake 10 minutes. Cover crust edge with pie shield ring or strips of foil to prevent excessive browning. Bake 40 to 45 minutes longer or until crust is golden brown and juices are bubbly. (If crust becomes too brown, cover entire crust with foil.) Cool on cooling rack at least 3 hours before serving. 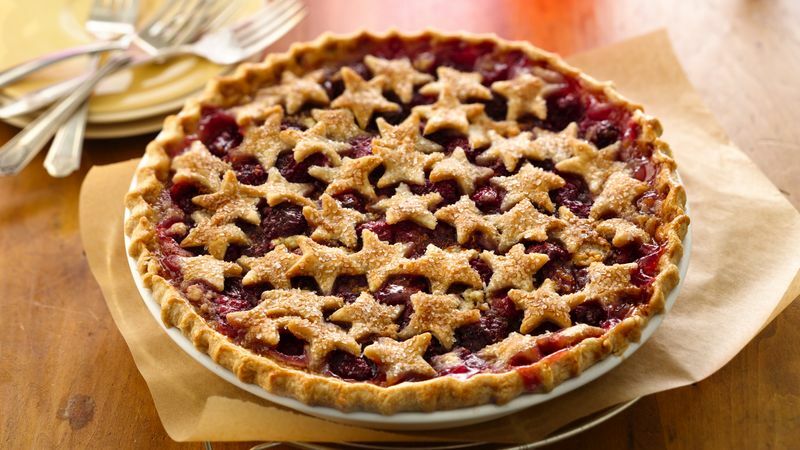 We've used stars to decorate this pie but different cookie cutters can be used to celebrate different events!